These locks are generally utilised by the emergency services in order to restrict areas unavailable to the public. Each one still has its own specific key, so only qualified personnel will be allowed entry. Significantly more durable than a residential lock, these giant mechanisms are vital for ensuring only specific persons can quickly reach areas where they’re needed. Ironmongery Experts also stocks a massive variety of the more standard locks and latches too, so if you’re in need of a fixture for a workplace environment, look no further than our range of contemporary digital locks. Convenient, compact and dependable, each one can be programmed with a unique code of your choice for efficient preservation of restricted areas. If the contemporary approach appeals to you, our mortice sashlocks are an innovative hybrid of the traditional mortice deadlock and the modern mortice latches, combining safety with ease of use in a stylish and practical format. When you need a compact, all-purpose lock for your front door, browse our assorted rim locks & night latches. The innovative design efficiently protects your home while remaining versatile and easy to use, doubling as a latch and a lock for any occasion. 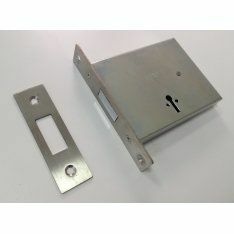 We also supply a large variety of mortice bathroom locks, designed for indoor use. These locks prioritise privacy and partition over security and resilience, so even locks and latches that don’t require keys at all are catered for. For those with more unorthodox door compositions, consider browsing our assorted rebate sets and sliding door locks & latches. From the rustic 5 lever designs to the contemporary arrangements of otto handles and sliding pull latches, you’re sure to find a look that strikes your fancy. On the other hand, if you require some heavy duty protection for industrial purposes, our budget locks are a highly dependable option. These fixtures are designed to take a beating, and their resistance to erosion makes them suitable for outdoor applications. In the case of more domestic functions, our range of magnetic catches and roller catches will ensure your cupboards, wardrobes and doors perform smoothly and seamlessly every time. With a varied assortment of models to choose from, compatibility will never be an issue in your home again. For a classic return to form, explore our array of padlocks. Simple as well as effective, the imposing image of an iconic padlock is as much a deterrent as it is an assurance. Best applied to gates and fences, these fixtures can be utilized with confidence.